Looking for a Kosher-friendly alternative of the traditional Isagenix shake? Look no further! Isagenix Kosher IsaLean Shakes are delicious, healthy shakes designed to help you burn fat while safely reducing calorie intake and maximising nutrient intake. A balance of quality whey protein with active enzymes assist in absorbing nutrients, while hunger-satisfying fibre, nourishing vitamins and a blend of minerals ramp up the nutrient content. Are you curious about the Isagenix diet, but unsure if there are products available to meet your Kosher dietary needs? Luckily for you, the IsaLean system is suitable for everyone! If you want to lose weight quickly without compromising your Kosher diet, look no further than yummy Kosher-friendly IsaLean shakes! These tasty shakes are made from quality whey protein and lots of fibre to keep you feeling fuller longer, tons of vital minerals and vitamins to nourish your whole body, and active enzymes to help your body absorb all of those important nutrients. The shakes come in delicious, creamy vanilla that will satisfy any sweet tooth. These delectable shakes are Kosher-certified, so you can be sure that you’re meeting your dietary needs while burning fat on the Isagenix diet. Meal-replacement IsaLean shakes are a cornerstone of the diet, allowing your body to enter a state of ketosis and burn fat rapidly. One shake contains an amazing 23 grams of protein and 21 different vitamins and minerals. Full-body health and nutrition is a vital component of the Isagenix diet, and these yummy shakes will be sure to nourish you as you lose weight. With this meal rich in fibre and protein, you’ll see a decrease in food cravings and an increase in lean muscle mass. 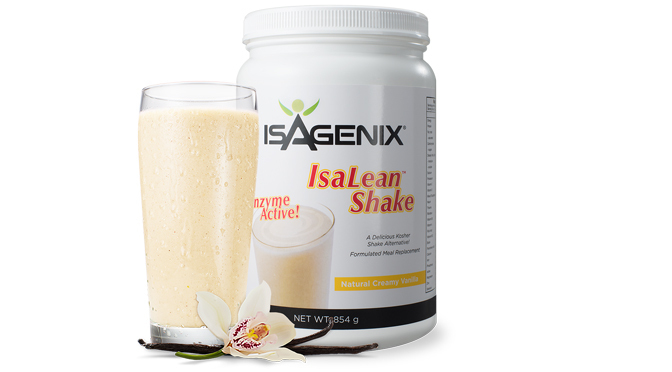 IsaLean shakes are unique because they are made from proteins from cows not treated with antibiotics. This means that you’re getting nutrition that is completely natural and safe for your body. Many diet products contain artificial ingredients, but Isagenix aims to cleanse your body for long-lasting results. The shakes are important because when you replace a meal with a shake, you’re minimizing the calories that you consume while still getting all of the nutrients that you need. This allows your body to focus on burning fat stores. The enzymes in the shakes break down the nutrients in the most efficient way possible, maximizing the nutrients that your body absorbs. This means that you’ll feel healthy and nourished as the pounds melt away!